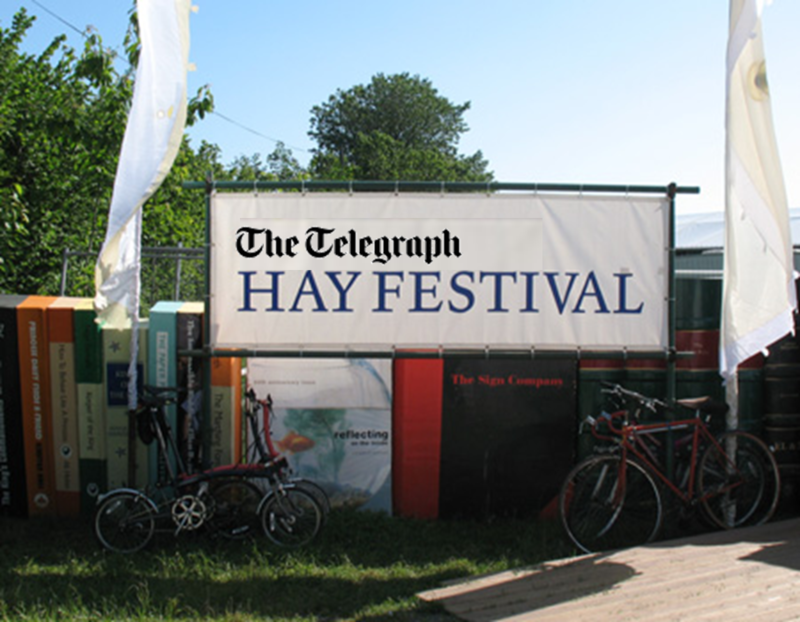 Will the Telegraph Change the Hay Festival? There are sponsorships that are made in heaven and the Guardian’s long running partnership with the Hay Festival was one of them. Very quietly last October the Guardian swept out of Hay and the Telegraph was ushered in with a three year deal to attach their name to the now growing list of Festivals that have emerged from the small Brecon town and are encircling the globe in celebration of the arts. So if the Festival couldn’t go to Segovia or Zacatecas without keeping the name Hay in the event title, can it remain true to itself with the Guardian moniker making way for the Telegraph? Whilst the subject matter for the annual fest has emerged from the printed page and grown to encompass the performing arts there has always been a powerful political undercurrent during those 10 days in May. In 2008 John Bolton, the former US ambassador to the UN and advisor to George Bush narrowly escaped an attempted citizen’s arrest for war crimes by writer and activist George Monbiot. Last year the 2010 festival goers held their collective breath as they awaited news of the best-selling Swedish author Henning Mankell who instead of being at the festival was on board a the convoy of Gaza-bound boats stormed by Israeli forces. The festival’s biggest draws have invariably been from the centre left, Vince Cable, Gore and Clinton, journalist John Pilger. Miliband is a regular but I don’ think Cameron has ever been. For a decade the only daily paper on sale at the site has been the Guardian and I’ve never heard a single complaint. You couldn’t cite a more certain collection of Guardian readers than at Hay in May. Will it change? It’s difficult to see how it can be avoided. This entry was posted in Event news, General stuff. Bookmark the permalink. If my memory serves well I think the Sunday Telegraph were an the first title sponsor of Hay. Its was The Sunday Times for years before The Guardian ad The Independent for a short while before that. My experience is that the sponsor has an impact on the audience but less so on the programme. Always pretty liberal, centre left. We’re really sorry not to be involved with Hay any more, but I guess, since the final decision was made in the week of the comprehensive spending review, and three times as much money was on the table, I can see why the decision went that way. We do have lots of happy memories on our Haycast archives, though, and I doubt the Telegraph will be able to match that! So, you never know, perhaps one day we’ll be back. Hope so! I’m bereft about this decision. I went to it for the first time last year having followed it online and other ways. I cannot knowingly associate with Telegraph and Sky. I do realise they are giving the festival money…but the only reason a corporate organisation gives money away is to gain influence and I am unwilling to be influenced “or tainted” by them. I’m frantically searching the fringe to see if its a viable programme coz Id love to meet up with “HAYMATES” just v.can’t abide the main joint. HowTheLightGetsIn offers a fascinating programme at the Globe in Hay – poetry, philosophy and great music during the Festival. Maybe that would suit you. Loyal Guardian readers will be washing, starching and ironing their treasured but shabby collections of free-with-the-Guardian bags. They will then carry these around defiantly at this year’s Festival. They will ignore the blandishments of the Daily Telegraph sellers who may try to tempt them with other bribes and free gifts of a rightwing nature. The newsagents in the town of Hay itself famously run out of copies of the Guardian in the holiday season. So, without doubt, it must be the newspaper most favoured by the book buying public. As a call to arms, let us be bold and carry our (slightly worn) Guardian-logo embellished cloth shopping bags with pride. Did you read the Telegraph supplement last week ABOUT HAY? Never read the rag til then, but my lovely Guardian never wrote about the town at all that I can remember. Half the time they were pretty sneery about the festival. I don’t think they produced this much coverage in all the years they were involved. Claire’s right – the Haycasts were terrific, but Hay has BB Radio 3 and 4 AND Chris Evans AND it’s own archive, and the Telegraph have already trumped them many times over in column inches. For what it’s worth, people round here don’t tend to define themselves by what newspaper they read. That would be pretty sad. It’s always seemed to me that Hay was a broader church (or maybe a broader Atheist’s tent) than that. PS – Comprehensive Spending Review? ?! Hay is SO not part of the Government’s budget, much as we might all like it to be. The Department of Hay Festival……. now that’s an idea. PPS – Vince Cable centre LEFT? hahahahahahahahahahahahaha. Those were the days! PPS – Clinton, Pilger, Benn, Callaghan, Foot (both Feet, Michael and Paul) all came to Hay when it was sponsored by The Sunday Times. John Bolton, Richard Perle, George Osborne, Michael Gove, Niall Ferguson, John Major all came to Hay when it was sponsoredby The Guardian. But they ALL CAME TO HAY for the FESTIVAL. I know whose camp I’m in. I’m actually looking forward to seeing what The Telegraph are going to bring to the party. If their support brings more great writers to more people im all for it. Also haven’t they covered all of the international festivals since they took over?I don’t remember the grauniad ever doing that?